To experience the power of story, we're going to have a storytelling exercise called “Peaks and Valleys.” In this exercise you'll have an opportunity to reflect on key experiences of your personal story — the peaks and the valleys — and then tell your story to one other person in the group. So I invite you to engage with this exercise with the courage to be vulnerable, know that the reward is greater connection! I’ll walk through the instructions, answer questions, and then play some music while you complete your Peaks & Valley chart. Step 1: What you are going to be doing is creating a graph of some of the peaks and valleys of your life experiences, and the values, beliefs and attitudes that were shaped by those experiences. To begin, draw a graph on your piece of transparency paper that looks like this one. Be sure to include the labels you see here. Write Peak and Valley on the Y axis and Childhood to Present on the X axis. 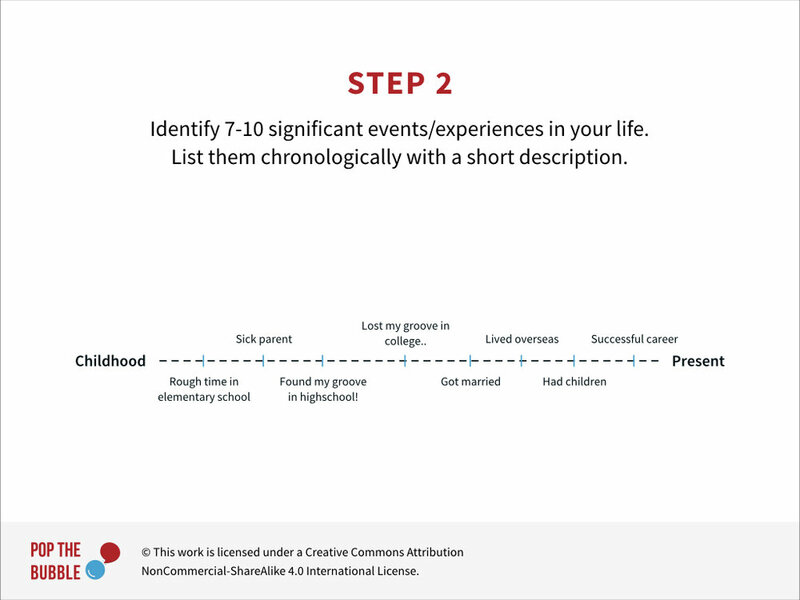 Step 2: Identify 7-10 significant milestones or events that have happened in your life. Indicate when in time each experience occurred. Identify each experience with a short description or picture. 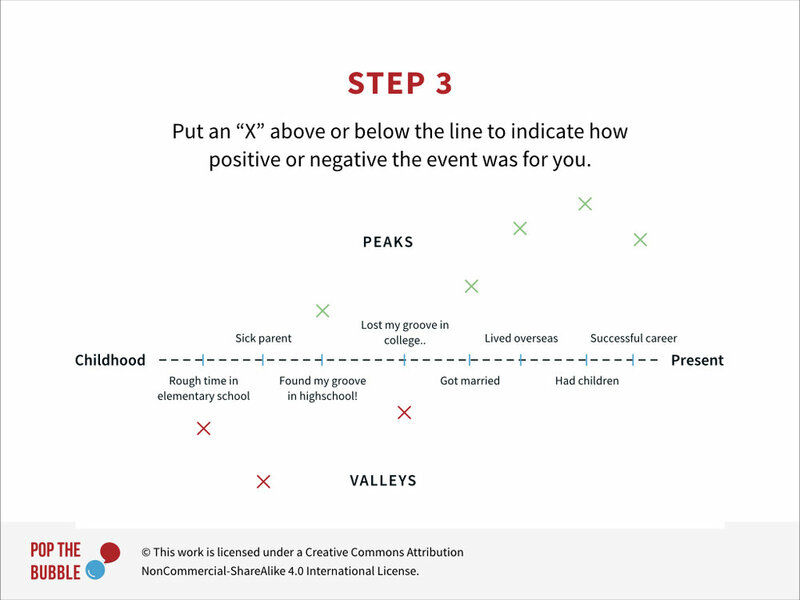 Step 3: For each positive experience, put an “X” above the line representing how highly satisfying or positive it was for you. For each negative experience, put an “X” below the line representing how unsatisfying or negative it was for you. Step 4: For each check mark, ask yourself: "What values, beliefs or attitudes did I learn from this experience?” Write it down next to the event. Step 5: Connect the “X” marks to make your peaks and valleys. I’m going to play some music now and give you about 10 minutes to complete your charts. After that we'll discuss what's next. What we’re going to do next is break into pairs to tell our story, and to listen to our partner’s story. Please find a partner, preferably someone you do not already know, or know well. Find yourself a quiet space to be together. Feel free to go outside if you want. You will each have an opportunity to tell your story. The person speaking—Person A—will have 10, uninterrupted minutes to tell their story. For the first 10 minutes, Person B just listens. For the next 5 minutes, Person B will be able to ask questions – to clarify, to inquire. After 15 minutes, switch roles. It’s Person B’s turn now. Finally, I’ll be keeping time, and will let you know when the 10 minutes are up and it’s time to switch to questions, and when 15 minutes are up and it's time to switch storytellers. 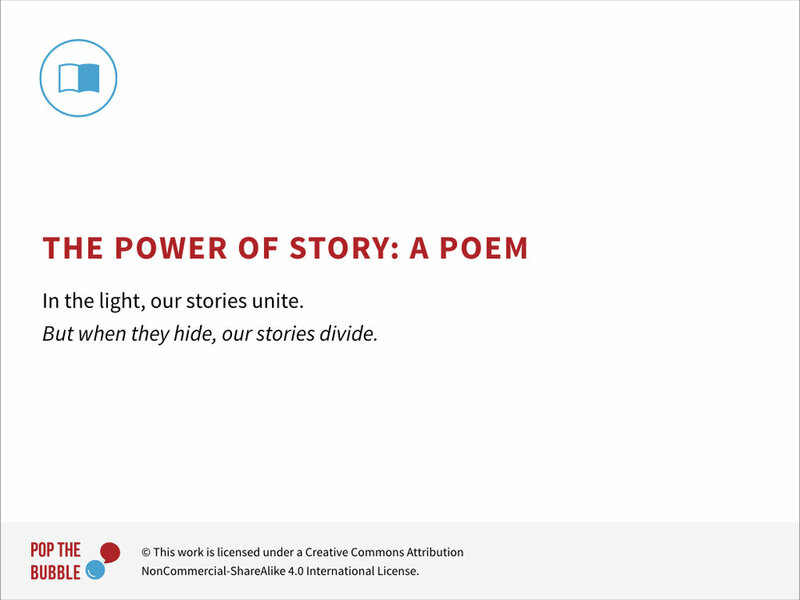 After both storytellers are done, we'll come back together to share some reflections. At that time please be sure to sit next to the person you shared your story with. Thank you everyone for your participation in this exercise. Let’s take a few minutes to reflect on the experience. Here are some questions to get us going. A fair amount of research has been done on why telling our stories can be so powerful. Here's a brief summary of what's been discovered. So this is the proposition I want to leave you with as we close this section of the workshop: That at the heart of every conflict is an unspoken story. And it is when we uncover that story that a deep and lasting relationship is achieved, one that allows us to work together to find new, creative solutions to our challenges. And finally, here is a small poem that for me, summarizes our entire first exploration: In the light, our stories unite. But when they hide, our stories divide! We're going to take another short break, and then go into our second exploration: The limits of our story.